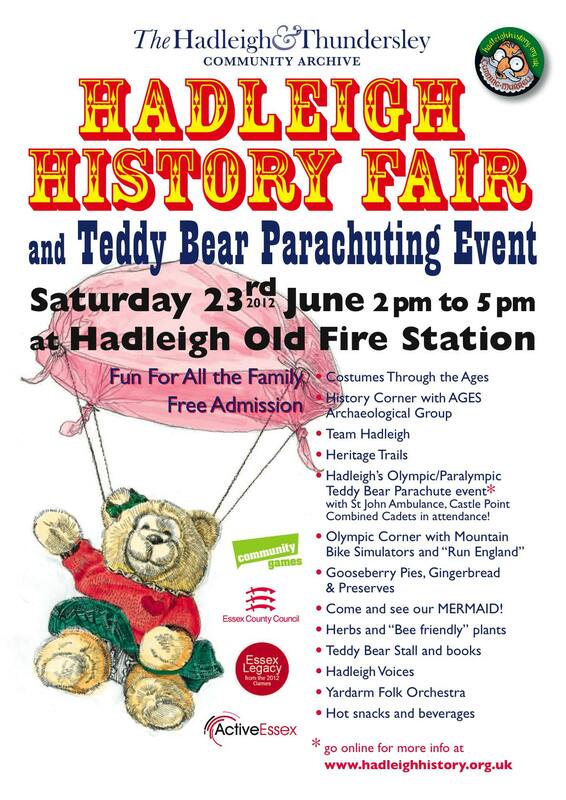 The Fair is to be held on Saturday June 23rd, 2pm to 5pm at Hadleigh Old Fire Station (HOFS) and is organised by the Hadleigh & Thundersley Community Archive. There will be displays about Hadleigh’s past, experts to talk to and costumed characters to meet (including Cunning Murrell). Essex County Council’s Legacy Team will be there too, to talk about plans for improving Hadleigh Country Park. 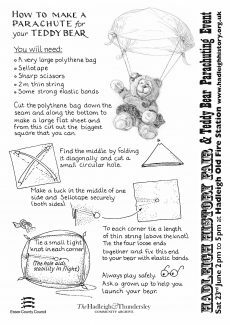 To tie in with the Olympics, there will be a gala Teddy Bear Parachuting Event from the top of the Firemen’s Training Tower and children (young and old) are invited to compete by making a parachute for a favourite toy bear. The annual fair was quite famous. Midsummer’s Day was a Quarter Day, one of the four days on which, since the Middle Ages, contracts for farm workers and servants were renewed, rents were due and leases were assigned. Hadleigh was an agricultural district – 90% of the people worked on the land – and substantial business was carried out during the annual fair. Midsummer’s Day was a time for letting one’s hair down a bit too, and having some fun. Peep Shows would come to town, advertising curiosities such as Human Skeletons, Two-headed Sheep, Bearded Ladies or Mermaids. Gooseberries were in season, so Gooseberry Pies were always on the bill of fare. Gooseberry Pies and Gingerbread will be on the menu again at Hadleigh History Fair and there will be a mermaid too (of sorts)! 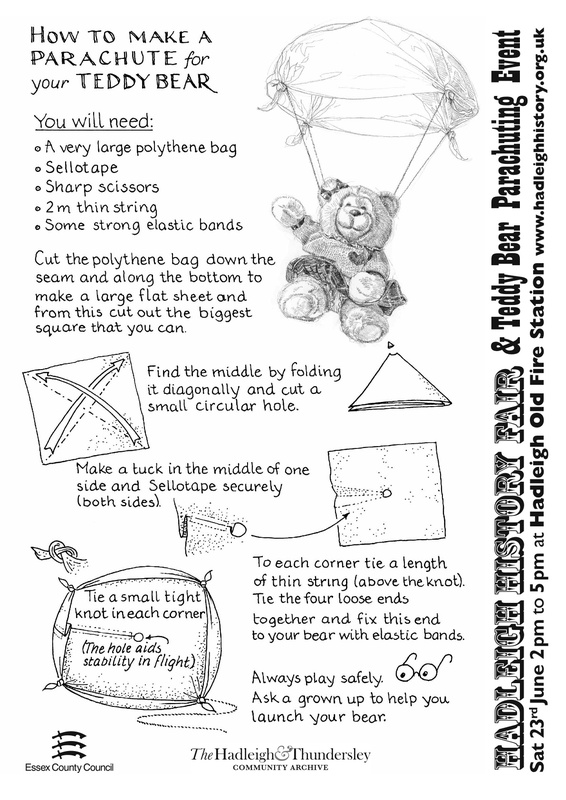 Here are instructions for parachute making, no liability accepted for loss, damage or missing bears. Here are the Gooseberry Pie competition rules. Betty’s concerns are not entirely misfounded. One very small teddy bear with an over-sized parachute actually parascended when launched from the top of the Firemen’s Training Tower by retired Fireman Brian Hickey and was last seen gaining height and sailing in a north-easterly direction over Morrisons. The teddy bear’s owner, Lily May Violet, was naturally somewhat distraught but eye-witnesses claim that the bear was deliberately and expertly guiding the ‘chute and was intent on getting back to darkest Peru. Several other bears suffered mild trauma and were treated expertly for sprains and shock by volunteers from Castle Point Combined Cadets of St John Ambulance. The event will be held again though, after this year’s harrowing experience, there will be a Disclaimer Form for each bear to sign. Dear All Just been past the fire station. Teddy bears are dangling outside in the rain! Dear Madam/ Sir, Why are people so cruel to teddy bears? Why are people throwing them off tall buildings all the time? Is this persecution?